Used to measure the resistance of concrete to deterioration caused by repeated cycles of freezing and thawing. The Resonance Test Gauge is used for Flexural and torsional resonance testing of concrete, rock, asphalt and masonry. Fully automatic operation frees operator to perform other lab duties. Permits the evaluation of variables in concrete properties and conditioning. 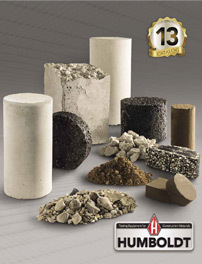 Useful in the evaluation of the durability of aggregates, as well as the properties of admixtures. The Sonometer determines changes in resonant frequency of concrete specimens subjected to alternate cycles of freezing and thawing with the Humboldt freeze-thaw cabinet. This apparatus closely follows design parameters set up over 40 years ago by the Portland Cement Association research laboratories. The original PCA design has been modified by changing to solid state circuitry and addition of a built-in cathode ray oscilloscope. No other resonant frequency system includes an oscilloscope despite being strongly recommended in ASTM C215 paragraph 4.2. Other systems offer an oscilloscope connection. The oscilloscope confirms that peak reading on meter is actual resonance and not a harmonic. Humboldt provides a wide selection of freeze-thaw equipment from several manufacturers to choose from. If you have questions or need help selecting equipment, please call us at 1.800.544.7220 or use our Quick Response form.